Manchester Metropolitan University has been recognised again as one of the country’s most sustainable universities, receiving re-accreditation from the National Union of Students (NUS) as part of its Responsible Futures programme. One of only seven UK universities and colleges to receive this accreditation in 2018, it was announced on Wednesday that both Manchester Met and our Student’s Union were successful in achieving accreditation for the second time. The announcement was made at the NUS Sustainability Summit, hosted at the Manchester Metropolitan University Students' Union. Mayor of Manchester Andy Burnham, NUS Vice President (Society and Citizenship) Zamzam Ibrahim, and Tony Juniper, Executive Director for Advocacy and Campaigns at WWF, introduced the Summit. Taking part in the original pilot of the Responsible Futures programme, Manchester Met has been a leader in prioritising sustainable development through research, teaching, and changing student attitudes about being environmentally and socially responsible. Colleagues across the University have worked hard to ensure that we are committed to being a green university. Activities included the Carbon Literacy Programme, led by Dr Rachel Dunk and Jane Mork from the School of Science and the Environment in partnership with the Environment Team, and the Carbon Literacy Project, offering staff and students the opportunity to develop skills and knowledge on Carbon Literacy. “We are so proud be one of only a few universities in the country to be re-accredited in the NUS Responsible Futures programme. It’s vital that we all play our part in keeping the environment healthy, on and off campus. “Manchester Met is leading the way in education for sustainable development in teaching and learning – as shown by this achievement – by active engagement of students to develop skills and knowledge linked to sustainable development, and activities such as the free Carbon Literacy courses that we run here. Responsible Futures is a supported change programme and accreditation mark that works to put sustainability at the heart of education. 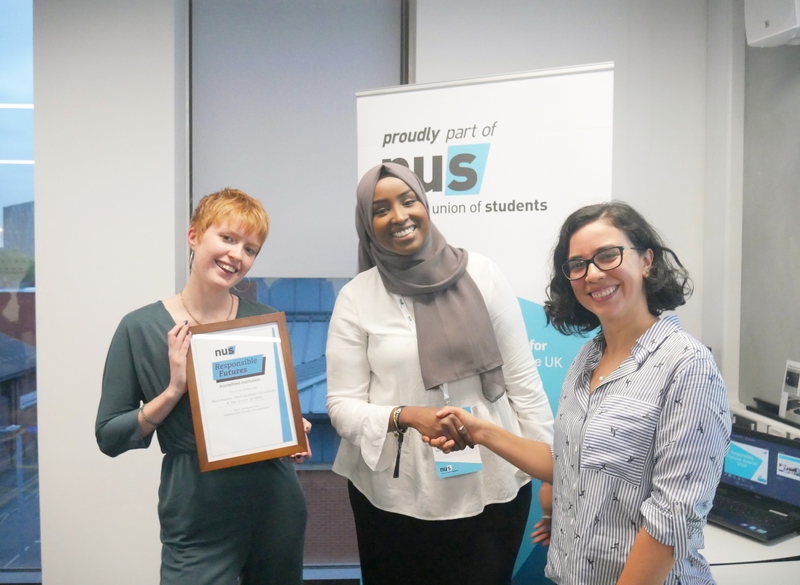 The programme, led nationally by the NUS, works to create an enabling environment in which staff and students can work together to embed social responsibility and sustainability into the formal and informal curriculum. Six students were hired to undertake an audit, assessing whether Manchester Met meets certain criteria for re-accreditation. This involved examining all aspects of university life and giving a score to each given criterion. The student auditors spoke to members of staff, and as well as looking at the curriculum and extra-curricular activities - such as societies, social events and outreach projects. After the auditing process, one of the student auditors founded the Manchester Met’s People and Planet Society, which can be contacted at mmu.peopleandplanet@gmail.com and found on Facebook at MMU People and Planet. Chloe Andrews, worked as Project Assistant for the re-accreditation through Jobs 4 Students. She recently graduated from BSc. Ecology and Conservation, and now works as Sustainability Engagement Assistant in the Environment Team. “It’s always students who lead the audit. We think that this gives a good perspective in the sense that education for sustainable development, and Responsible Futures, is all about providing students with the skills and knowledge needed to lead the world to a fairer future. To find out more about Responsible Futures at Manchester Met, click here.